NESTEC’s Web Index of Products and Services | Nestec, Inc.
NESTEC’s improvements make it possible for industry to remain in regulatory compliance while continuing to turn a profit. 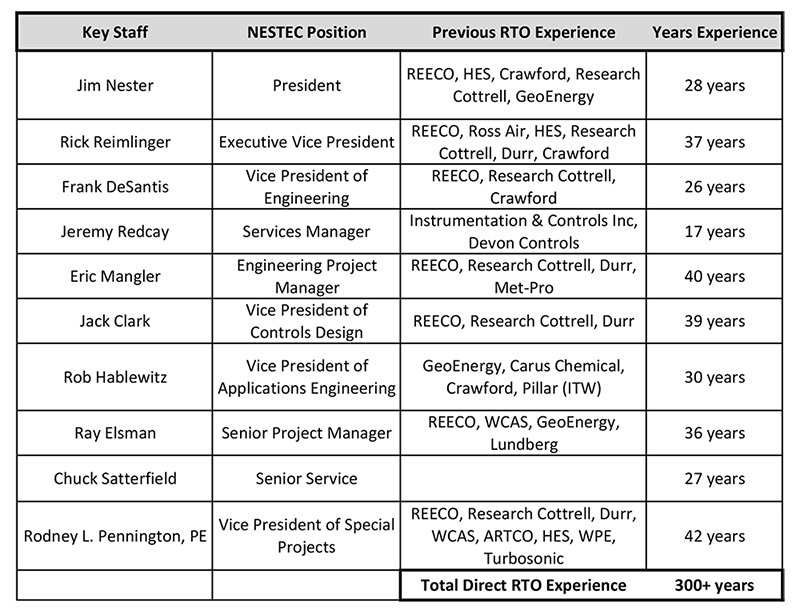 In addition to NESTEC’s in-depth experienced staff shown below, the following web index provides a quick reference to our website for detailed information regarding our products and services. We certainly appreciate the opportunity to assist you with any of your RTO, air emission control or energy conservation needs. We can also arrange a detailed review of any existing needs. Please contact us for additional details regarding any RTO or any other air emission control or energy conservation item. …the minimum operation cost, both total electric and fuel? …maximum destruction removal efficiency (DRE)? Including, but not limited to, equipment rebuilds, upgrades, utility optimizations, routine maintenance, inspections, and repairs.